This prisoner's song of utter longing and despair opens Behan's first play "The Quare Fellow," and frames it thereafter; sung off-stage (originally, when the play was first produced, in Dublin in 1954, by Behan himself), it comes as if from a lockdown cell. Greil Marcus, The Invisible Republic, New York, NY, 1997, pp. 256-257. 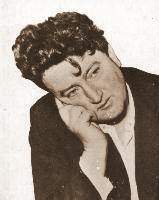 Original recording by Brendan Behan on "Brendan Behan Sings Irish Folksongs and Ballads" (Spoken Arts). Original lyrics from Brendan Behan's play "The Quare Fellow", as staged at the Theatre Royal, Stratford, London, E. 15, May 24, 1956, and reprinted (© 1956 by Brendan Behan and Theatre Workshop) in the Evergreen Black Cat edition of "Two Plays by Brendan Behan: The Quare Fellow & The Hostage", New York, NY: Grove Press, 1964. A prisoner sings; he is in one of the punishment cells.